Prior to taking up triathlon Eimear competed internationally in Tetrathlon, a multisport similar to modern pentathlon. At university she studied Sports Psychology and soon after graduating decided to become a PE teacher. It was around this time that she took up triathlon and with the help of her first coach Mark Booth she progressed as an age group athlete and won numerous national titles. 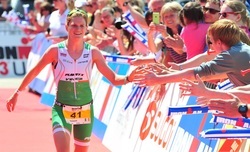 In 2011 Eimear’s professional triathlon career of off to a great start when she won her first professional race and in 2012 she won her first Ironman 70.3 and Ironman titles becoming Ireland's first ever Ironman Champion. In 2013 Eimear left a career in teaching to become a full time Triathlete when she joined Team TBB and was coached by Brett Sutton. Since then she has had many race wins and podiums and represented Northern Ireland at the Commonwealth Games. She currently holds the Irish Ironman record (8h56) and has won 3 Ironman races and 8 70.3 races. After a long injury break Eimear spent the 2017 season gaining fitness at Thanyapura in Phuket. She returned to racing in November 2017 with a win at Xiamen 70.3 in China. She is currently expecting her first child and aims to return to professional racing in 2019.